Sophomore Tayte Kelly scored her first three-goal hat trick for Wood River High School and freshman Jesse Cole (21 goals) added two goals lifting the Wolverine girls’ varsity soccer team to a 5-3 victory over the Canyon Ridge Riverhawks Monday. Wood River (7-4-1, 6-1-1 league, 19 points) all but wrapped up the second seed in next week’s Great Basin Conference tournament with a 23-4 shooting edge over the ’Hawks. The Hailey girls scored twice in the first nine minutes and led 5-0 at half. Junior Samantha Sutton and Jesse Cole dominated the middle of the field—Sutton distributing to the wings and the Wolverines applying relentless pressure on ‘Hawks freshman goalkeeper Alexis Dewalt (19 saves) from the outset. Outshooting the Hawks 12-0 in the first half with the benefit of a breeze, Wood River put on a passing clinic and played keep-away. A give-and-go between Cole and Tate Morell resulted in Cole’s first goal at eight minutes. Sutton delivered a perfect lead pass sending Kelly in alone for a 2-0 lead at nine minutes. Cole teed up a 30-yarder from the middle of the field at 29 minutes, 3-0. Junior wing Brigette Thomas, running well again after an ankle injury, set up the next two Kelly goals with terrific lead passes at 34 minutes and 39 minutes for a 5-0 lead at the break. Canyon Ridge (8-5-0, 5-3-0, 15 points), headed for the tournament’s third seed with a youthful squad (3 seniors, 6 freshmen), scored on two set plays and a penalty. After half, the ‘Hawks did a better job moving to the ball and filling the passing lanes. In the second half, ‘Hawks freshman Clarissa Henderson chipped home a loose ball after a Valencia Smith free kick at 42 minutes and senior Ellie Packham knocked home a loose ball in the box after a Henderson corner kick at 76 minutes. Packham’s second goal was a penalty kick at 78 minutes. Wood River hosts Jerome (3-7-2, 3-5-0, 9 points) for “Senior Night” today, Wednesday on the Hailey pitch and visits Minico (0-11-0, 0-8-0) on Monday, Oct. 7 in Rupert. League-leading Twin Falls (7-3-1, 7-0-1, 22 points) blanked Jerome 3-0 Monday while Burley (3-9-0, 2-6-0, 6 points) was a 3-0 winner over Minico. 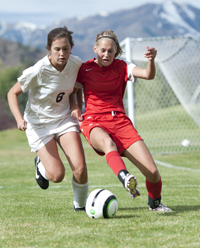 The Hailey girls came up on the short end of a frustrating 1-0 score Saturday in an evenly-matched non-conference game with the Madison Bobcats on the Hailey field. The Wolverines out-shot Madison 20-11 including 14-11 in shots on goal, but couldn’t put the ball home past Bobcats keeper Charlie Jensen (14 saves). Madison (3-5-1), a 2011 State 4A tournament qualifier, made Sidney Burell’s goal in the 19th minute stand up behind a defense led by junior stopper Rachel Orchard. Brigette Thomas hit the crossbar early in the game and Tate Morell rattled a ball off two posts just before Burell’s game winner. It’s looking pretty certain that the Wood River boys’ soccer team will host a first-round GBC tournament game Thursday, Oct. 10 as either the third or fourth seed in the six-team league. First, the Wolverines would like some payback at Jerome for a 3-0 home loss to the Tigers Sept. 16. The Wolverine boys visit defending league champion Jerome tonight and entertain the Minico Spartans for “Senior Night” Monday, Oct. 7 at 4:30 p.m. on the Hailey pitch. Today’s game times at Jerome have been flip-flopped because they will be played in the football stadium on the Tiger “Senior Night.” Junior varsity plays at 4:30 p.m. and varsity at 6:30 p.m.
Jerome (7-3-0, 5-3-0, 15 points) dropped a 4-1 road decision at Twin Falls (5-4-2, 5-1-2, 17 points) Monday. Also Monday, Wood River couldn’t finish and lost a 2-0 nailbiter in Twin Falls to the league’s top team, Canyon Ridge (10-1-1, 6-1-1, 19 points). If the Hailey boys earn the fourth seed, they will likely host Burley (3-9-1, 1-6-1, 4 points) in a first-round tourney game. The Bobcats posted two recent shutouts, winning 3-0 over Preston and 2-0 on Monday at home over Minico (2-10-1, 0-7-1, 1 point). Wood River’s scheduled game in Rexburg against the Madison Bobcats was canceled at the last minute Saturday because of a shortage of soccer officials in eastern Idaho.